Swimming App Professional - RH-SPORTS Website! Note: Currently this version focuses on open water swimming! Note: Currently this is a BETA version with problems with GPS accurracy! For a donation of 4 Euro you will get the Swimming App Professional in the PREMIUM Version. Please note that the current beta version has all features enabled which will definitely change in the next released version. Please use short button presses once or several times to navigate through the menu!!! 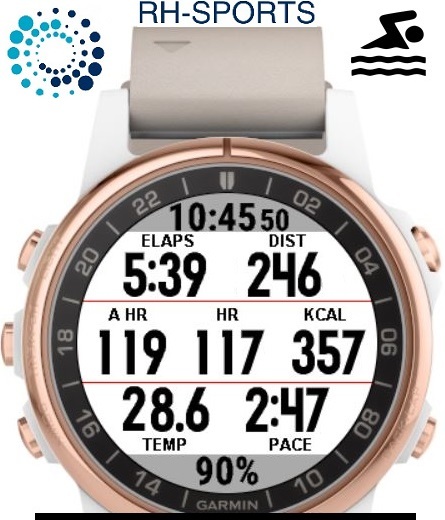 You can already now download the FREE BETA Version of the Swimming App Professional from the Garmin App Store. The PREMIUM Version where a registration key is required is in development phase and will be released in the third quater 2018 with additional features (e.g. support for indoor/pool swimming).